Konfrontationen is a festival of free jazz and improvised music held every summer in Nickelsdorf, a small village in the Austrian province of Burgenland close to the border with Hungary. To hold any kind of Improv festival in such surroundings must be counted an achievement; to hold one that year after year attracts the world’s biggest names in free jazz bar none brings the endeavour closer to one of heroism. The festival’s organizer, Hans Falb, has weathered the storms of bankruptcy and seen his commitment to the festival vindicated not only by the quality of the artists who come to play there but by audiences numbering in the hundreds – a uniquely European, perhaps even uniquely Austrian phenomenon. This year Falb curated the festival (which stretched over four days for the first time, another indication of its rude state of health) jointly with Swedish sax maestro Mats Gustafsson, fresh from his wedding in Nickelsdorf a few weeks earlier. Their joint pulling power ensured that the festival line-up read like a virtual who’s who of improvised music. I was only able to make two of the four evenings, but these alone provided a surfeit of riches, beginning on the Friday with the trio of Agusti Fernandez, Ingebrigt Håker Flaten and Paul Lovens. This group proved a bracingly effective curtain-raiser, with Fernandez’ glacial Schlippenbachian piano cascading around Håker Flaten’s flaying bass runs and Lovens’ ever forceful percussion. Flowing effortlessly from hypnotically quiet passages to full-on kit-driven assaults, the trio were never less than engrossing. Much the same could be said of Swedish Azz, Gustafsson’s homage to Swedish jazz of the 1950s and 1960s. This unit seem to have hardened up their act somewhat since the last time I saw them in Vienna, with Gustafsson and Dieter Kovacic in particular ramping up the electronic and noise elements of the group’s sound. Those still labouring under the misapprehension that Improv is po-faced and humourless could have done worse than to lend an ear to the last piece, introduced by Gustafsson as “an old Christmas song” and which saw the vestiges of the song in question being laid to waste by the two men’s scouring blasts of noise. More entertainingly still, Per-Åke Holmlander’s calm four-note tuba motif proved itself equal to this tempest and was more or less the only thing left standing by the song’s end. Without doubt the highlight of the evening, though, was a devastating set by an extended line-up of The Thing, with the standard trio of Gustafsson, Håker Flaten and Paal Nilssen-Love augmented for the occasion by Ken Vandermark, Joe McPhee, Terrie Hessels (of The Ex) and Johannes Bauer. It was truly awe-inspiring to watch this septet take the stage at 2.00am and play as if their lives depended upon it to a large audience that stayed rapt on their every note. Given the size and line-up of the ensemble, it came as no surprise that The Thing XL (as they were billed) approached the ecstatic fervour of the sadly absent Peter Brötzmann’s Chicago Tentet. The German, arguably the godfather of this whole scene, was to have his chance to shine two nights later; in the meantime, his gifted protêgés and collaborators made their own presence felt with their hugely exuberant big band sound. Live as on record (check out 2009’s Bag It! for the definitive Thing studio document), The Thing consistently astonish with the euphoria of their swing and their groove. You want to see gorgeous Swedish girls dancing the night away at a free jazz gig? You’ve got it, courtesy of The Thing and Konfrontationen 2010. A truly blistering night of free jazz and improvisation from five of its finest exponents. Consisting of a series of combinations of the all-reeds trio Sonore (Peter Brötzmann, Ken Vandermark and Mats Gustafsson) and Scandinavian power trio The Thing (Gustafsson plus Ingebrigt Håker Flaten on double bass and Paal Nilssen-Love on drums), the evening showed up the rock and noise crowds’ frequent claims to ‘extremity’ and ‘intensity’ for the empty boasts they are. With no guitars, no electronics and no amplification, these five gentlemen conclusively demonstrated that there is no music in the world more extreme and intense than the cry of a saxophone being flayed from the inside out, and the thunderous rumble of a drummer assaulting his kit into submission. The concert began with a beautifully balanced set from Sonore, followed straight after by an incandescent duo set from Brötzmann and Nilssen-Love. Next up, Vandermark and Håker Flaten varied the mood and pace considerably. 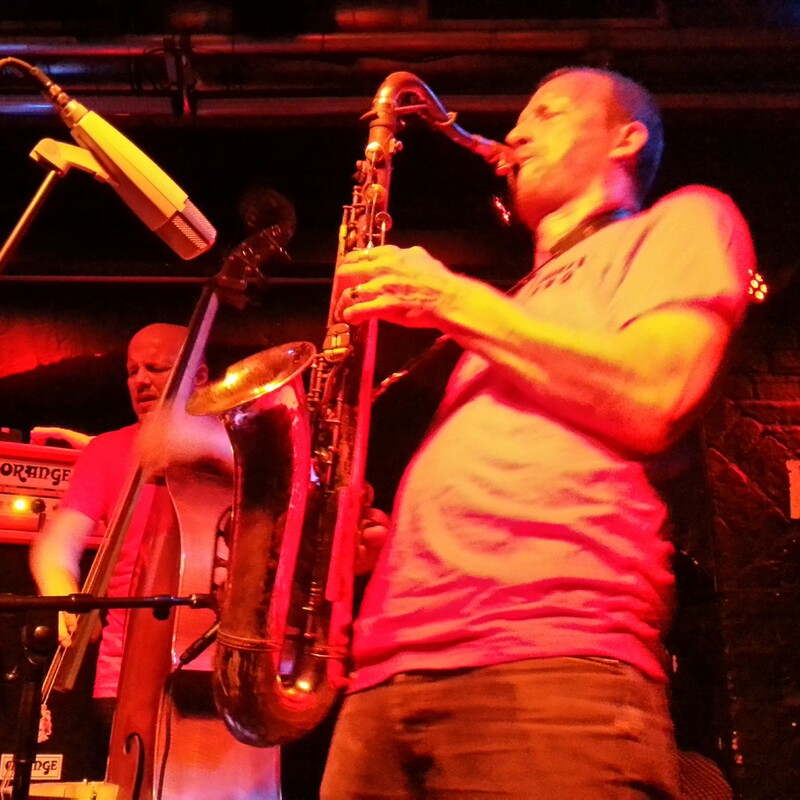 Vandermark showcased his sheer versatility, foregoing his usual Ayleresque attack with a bout of cerebral blowing that reminded me of Anthony Braxton. Håker Flaten remained onstage for The Thing’s set, during which Mats Gustafsson played sax with a jaw-droppingly physical ferocity. The inevitable conclusion saw all five men come together in a breathtaking show of mutual understanding, improvisational flair and deranged sonic attack. Not much doubt in my mind about the concert of the month (although work commitments mean that I can’t be there, annoyingly) – an evening of blistering free jazz courtesy of The Thing, aka Swedish saxophonist Mats Gustafsson, Norwegian drummer Paal Nilssen-Love and Swedish bassist Ingebrigt Haker-Flaten. Regular readers of this column will not be surprised to learn that both Gustafsson and Nilssen-Love are frequent collaborators of the titanic German saxophonist Peter Brötzmann, Gustafsson in the all-reeds trio Sonore, Nilssen-Love in various group formats. Together with Haker-Flaten they walk the precipice between free jazz, out-there rock and garage punk. Gustafsson channels the spirit of Fire Music legend Albert Ayler in his inspirational sax playing, while Nilssen-Love attacks his kit with savage ferocity and the bassist anchors the whole edifice with his rock-solid pizzicato work. Playing in the intimate surroundings of the Blue Tomato, The Thing will surely blast the roof off the place. If The Thing represent modern European free jazz at its most extreme, saxophonist Paul Dunmall is an example of the kind of dedicated, unsung musician thrown up by the British free improvisation movement. Where Brötzmann and his ilk picked up the sound of American free jazz and took it even further out, Dunmall was part of a British scene that went in the other direction, towards abstraction and relative quiet. Best known for his membership of Mujician, a quartet led by the formidable English pianist Keith Tippett, Dunmall appears in Vienna with a trio that is effectively Mujician without Tippett, i.e. accompanied by Paul Rogers on bass and Tony Levin on drums. Intriguing evening in prospect – at least for those with good German, which counts me out – at the WUK this month, as Einstürzende Neubauten mainman Blixa Bargeld reads from his new book Europa Kreuzweise: Eine Litanei. As an attempt to answer the question “what does it mean, to be on a non-stop concert tour for two months?”, the book describes the monotony of movement, interrupted by restaurants, readings and meetings. As I noted in my preview of Neubauten’s last Vienna appearance in April 2008, Bargeld is a lyricist of great skill and acuity, his texts replete with tumbling wordplay and caustic imagery. Between Neubauten activity in recent years, he has given solo vocal performances under the title Rede/Speech, in which he treats his voice with a variety of foot pedals and effects equipment. Expect this not to be a standard book reading.